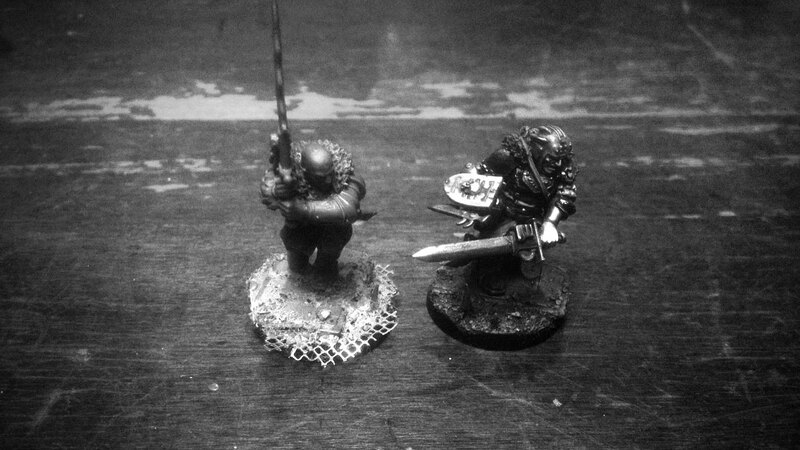 I decided to put my Red Corsair project to side for a moment and catch some waves with another project of mine – Inquisitor Valon‘s hunt party. Now some of you who have followed my earlier blog might remember Isaac Valon, the hero who was born in a whim of inspiration rather than in deliberately. With no certain plan he emerged from my imagination piece by piece and the outcome was more than pleasing. When Valon was ready I knew what his purpose was. His story would be tied tightly with Inquisitor Cassar‘s and Pherion of Mars‘ fates (both of them featured few years ago in Blanchitsu). But that tale is still unraveled and might stay like that for some time. In the meanwhile I thought to expand Valon’s retinue with suitable characters. They are known as the Hounds. Here’s the first one on the side of Valon, ready for priming. About the design aesthetics. Unlike with my previous Inquisitor retinue, the Rogues Malus, where all the characters were very different to each other in physical figure, it was my main idea to keep all the characters in Valon’s party very coherent. The Hounds are a band of brothers, forged in the field of battle where they learned to trust each other no matter what. They were a special task force whose purpose was to hunt down traitors and deserters of the front. Punishment for such act was beheading, hence the large two-handed sword. Heads of the traitors and deserters were passed to the Priest of Mechanicus who made sure they would serve the Imperium better than their original hosts. Valon had a chance to use the Hounds under his command during one of his campaigns. He was most impressed by the talent and the versatility of the pack and insisted to have them in his retinue. Ever since the Hound pack has followed Valon with great loyalty, from campaign to campaign, hunting for the sake of Emperor. It’s still hard to see the coherent feel as there’s only one Hound in the picture along the side of Valon, but when the next one joins them you’ll know what I’m talking about. But what’s up with the grayscale pictures? I know some of you hate when people use grayscale photographs for showing their work in progress. But I like to think that these monochromatic pictures capture the unfinished process with much more artistic touch, giving just enough to details, facts and idea to the viewer without spoiling the fun of viewing the finished piece. Besides, I use quite a lot of greenstuff in my conversions, so they tend to look pretty awful in colour before undercoat. I’m a big fan of Inquisitor Valon, and I’m glad to see his story and followers being expanded. The Hound here feels very much in keeping with Valon’s aesthetic. I’ve had the same feelings about the head ever since you first mentioned it. I might make a head swap at some point and use that one on someone else in the group instead, Astartes perhaps. Good point regarding 40kficication. I’ll add some power to his sword and perhaps something else. I tend to use way too much time in tuning the faces. Great to hear that, OwlShield. The new addition looks great. I love the subtle resculpt of his face. Is that a Flagellant head? Regarding the greyscale vs colour pictures; I actually like to see both. 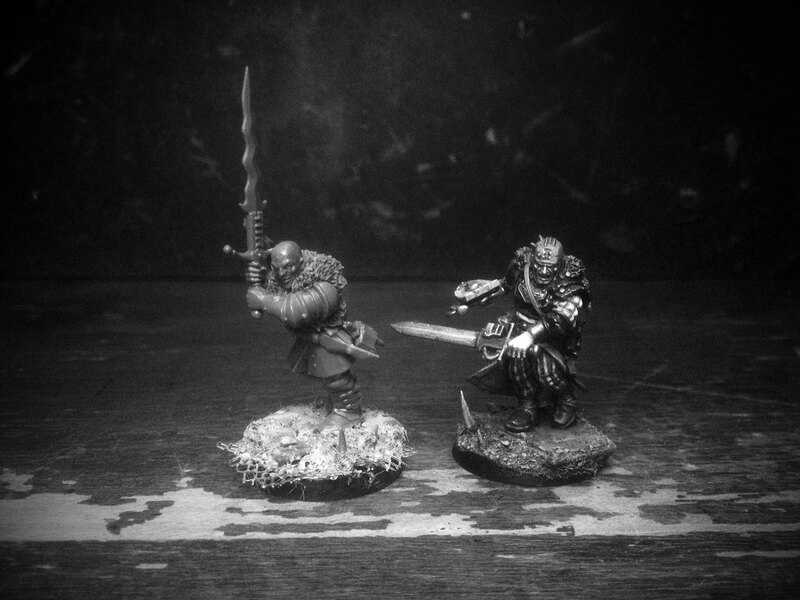 The greyscale makes it much easier to see the whole effect of the conversion, but as someone who’s still a relative novice at this, I can learn a lot by studying how others have achieved their results. I’m currently working on a project involving art-scale marines and I spent a long time studying your Red Corsairs and Migs’ Alpha Legion before beginning. It was a big help and learning from your techniques is helping me get results much better than I hoped for. Thanks MonkeyBallistic. Yep, that is the head from Flagellant kit. One of my favourite heads of all time. This must be the fifth miniature where I use it. I used Migs Legion WIP shots along with some others I had dug out from the web as a reference when I did my first art-scale marine 😉 It is true that you can learn a lot from other’s WIP shots. Good point, so to say. I promise I’ll share some colour shots after I’ve done some modifications to this Hound. Hmm, some subtle bionics would be very nice. I don’t mean complete arms of legs, or entire faces. But perhaps a bionic hand (or finger even) or foot. Some sort of communicator device on his ear might be another nice touch. How else would he stay in contact with the rest of the Hounds and the Inquisitor whilst in the middle of melee? The communication device is pretty good idea. Cheers for that, malika1! I’ll check it out. Fantastic! I love the hound. Your lip sculpting is inspiring! I second the idea of an ear-mounted coms device. Or maybe a bionic ear replacement coms device (like a half-Lobot). Oh I love this! You are absolute genius when it come to throw bits togehter, especially the combo of warhammer empire and 40k is absolutely awesome! Thanks for posting!